It's about the journey - and the destination: your lab. The Ohaus Adventurer is a balance that has been set up to deliver desired and accurate results to you. This is done through careful incorporation of inventive features that are functional. It has simplified testing features that happen every so often. Focus on measuring is done by a touch screen that has GLP/GMP compatible capabilities as well as two USB ports among other appliances. The features that set it apart are discussed below. This is used to enhance the experience and accessibility when using the balance. There is enough space that has been created by the two piece top-mounted draft shield that has open doors. The doors ensure that samples are not congested. It also ensures the draft shield at the back reduces the foot print. The Ohaus Adventurer ensures that performance remains excellent. It also gives the best results after weighing and how good it is. They are the three main features that without them, the important aspects of the laboratory weighing will not be accomplished and may as well be faulty. The Adventurer's fast stabilisation improves the results from the laboratory. These features also ensure that that the laboratory delivers stable and reliable test results every time. For monitoring and reporting the data that has been collected, the Ohaus Adventurer comes with a dual USB port with GLP/GMP tracking features. One is at the front while the other is at the back. The front port is placed there for easy accessibility thus simplifying the whole process of feeding data into the system. The one at the rear is usually used when you want to connect the machine to a PC. To ensure clarity when viewing, the angle has been made wider, while all the applications can easily be accessed on the coloured touch screen. The screen can even be used when the operator has their gloves on. This has been made possible so that the inconvenience of removing and wearing gloves are not an issue. This also prevents instances of contamination that can occur when performing the tests. The screen simplifies the whole process and saves on time. You can easily operate and access the Adventurer's nine application modes and abundant features that eliminate the need to do several manual calculations through the modern colour touch screen. Ohaus models have six mechanical keys. These keys enable the user to get feedback as well as allowing the operator to perform procedures more than once. These can include taring, zero calibration and print. This calibration technique ensures that there is automatic maintenance to the balance on a daily basis. It also has an external calibration. This has to be operated manually. The user has the freedom to choose their calibration weight value. It ensures there is accuracy. A real time clock is fitted in the Ohaus Adventurer models. The clock's major function is to ensure time accuracy even in instances such as power surges. The data function records the project and sample names, as well as the balance's identity. Such data is important when you want to trace the profiles and compliance requirements. These are typically made of glass panels that reduce the space required on the lab bench when the doors are opened. They are wide enough and provide unobstructed access. Large vessels can be placed comfortably, avoiding any instance of spillage. 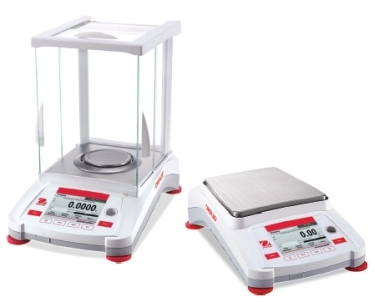 This is used to display the current sample weight. If it is below the defined minimum limit, it automatically increases it to ensure that the results are accurate and up to the required standard.